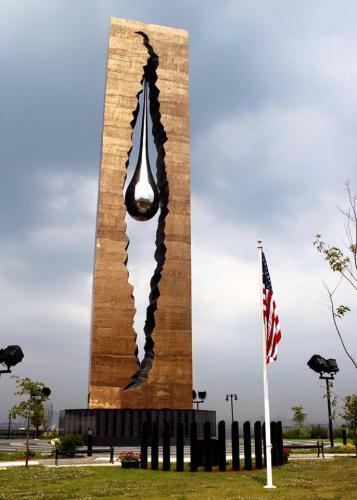 This "Tear Drop" 9/11 memorial exists right across from NYC and yet we do not hear about it. This is a 100-foot tall monument given to the U.S. back in 2006 by the Russian people in memory of all those that lost their lives on 9/11. The breaking in the cracked facade forms the shape of the two towers. The giant suspended tear drop symbolizes all the tears the world had shed in response to this terrifying day. Absolutely beautiful. It is located in Bayonne, New Jersey, which is just on the other side of the water near the Statue of Liberty. It is a shame that such a beautiful memorial is given barely any attention; it should be shown every year around this time. You're right, Marge. It's only vaguely familiar. Perhaps it's better to keep this from the Dems or they will deface it.